QuickPar is a utility for creating Parity Volumes using the Reed Solomon algorithm. Parity Volumes may be used to verify that a set of files have not been corrupted, or to reconstruct damaged files. QuickPar does work very well on XP / Vista / 7. QuickPar has NOT been updated for 5.5 years, come on and get the lead out and update this software. If you aren't going to update the software, then upload the source code to Source Forge! I rated it a 4 because no updates for 5.5 years. A good program. After 4 years it's still the newest and best in a very small field, it gets the 5 stars, if there were further development in the field by anybody it would probably rate lower. QuickPar 0.9.1 has several problems, that would probably have been addressed by now if it hadn't been abandoned. To wit, it takes up a lot of resources (processor/memory-wise) when in use. Doesn't let one queue up several par2 scans in sequence to minimize the slowing down of one's system. Doesn't PAUSE! Doesn't have a run in background option. 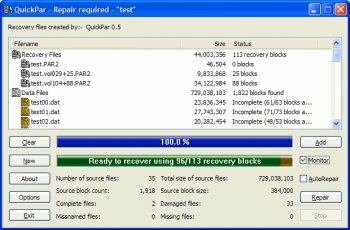 The best error detection and recovery freeware for Windows. It's a bit sad that PAR2 is still the latest algorithm supported in freely available software. Error detection and esp. correction algorithms have progressed since the days of Reed-Solomon. Still, what QuickPar does, it does well. Well, we know hardgiant neither serious nor honest. QuickPAR is virtually a completed program with no weaknesses I can find. It's never failed me in several years. Fails to repair a lot of the time. This is a rather buggy program. Sometimes multiple runs are necessary to get the job done. QuickPar's tech support always blames the users hardware even if your machine can pass prime and whatever other stress test. It's to bad people are using Par 2 when it is not ready for primetime. Required tool for use with downloading "stuff" from newsgroups. It supports SFV file checking. It supports PAR2 file checking. It supports PAR file checking. It supports file reconstruction via PAR2 and PAR files. It supports PAR2 recovery block generation. An absolutely wonderful tool. Its pretty fast and gets the job done. Very easy to operate. Excellent tool for its purpose, but it loses 1 star because it stores shortcuts of combined files in the Local Settings folder, which may present a privacy risk. If you upload to or download from Usenet (newsgroups), you can use QuickPar. This is one of the most useful and most-used programs I have ever installed! It's the best parity volume builder and file-fixer I've ever used. It's on my must-have list for any new computer.